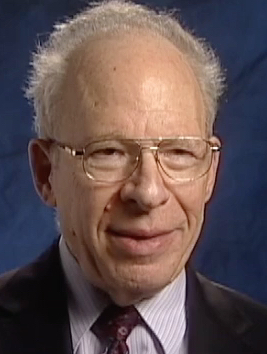 Richard Garwin is an American physicist. He was born in 1928 in Cleveland, Ohio. Garwin has had a long scientific career, focused on invention, conducting research, and advising policymakers and U.S. Presidents. After earning a degree in Physics from Case Western University, Garwin went on to earn his Ph.D. from the University of Chicago. There, he met and studied under Enrico Fermi. Fermi described Garwin as a “true genius.” In 1949, after earning his Ph.D., he taught in the Physics Department at UChicago and worked as a consultant at the Los Alamos laboratory. Garwin played a crucial role in the development of the first hydrogen bomb. He designed the device tested in the "Ivy Mike" shot at Enewetak Atoll in the Marshall Islands on November 1, 1952. Garwin worked at IBM’s Watson Laboratory from 1952 to 1993. He has conducted research in various areas, including on radar systems, Airborne Warning and Control Systems (AWACS), nuclear magnetic resonance, and superconducting computers. His research laid the foundation for a great deal of modern technology, including GPS satellite navigation, color monitors, laser printers, touch screens, air traffic control systems, and MRIs. Garwin has also become an advocate for arms control. He has testified before many Congressional Committees on atomic weapons, national security, transportation, energy policies, and technology. He has advised every president from President Eisenhower to President Obama. He served on the U.S. President’s Science Advisory Committee from 1962 to 1965, and from 1969 to 1972. In 2016, President Obama awarded Garwin the Presidential Medal of Freedom. 1928 Apr 19th Born in Cleveland, Ohio. 1947 Graduated with a degree in Physics from Case Western University. 1949 Received a Ph.D. from the University of Chicago.